Hashtags are amazing! Think of them as free advertising for your business. Using the right Instagram hashtags for your business is one of the most crucial steps to grow your account. They put your products and services in front of the right eyeballs, they link you to the right community, they make your posts searchable, they can get you featured on big accounts and on the Explore and Hashtag pages (= increase your posts visibility). Time to find some Instagram hashtags for your business. If you don’t know it yet, let me quickly introduce you to Preview. Preview is an app to schedule, plan, edit, analyze your Instagram feed. There are so many tools in this one app, but I want to focus on the star of the show for this blog post: the Hashtag Finder. The Hashtag Finder is an Instagram hashtag generator. You can search hashtags by categories, countries, cities and even Instagram communities. This last one is very important because communities are what Instagram is all about = how you connect with people = your customers. Preview is an Instagram planner. So there is a section to prepare your caption. In the caption, you can search for hashtags. 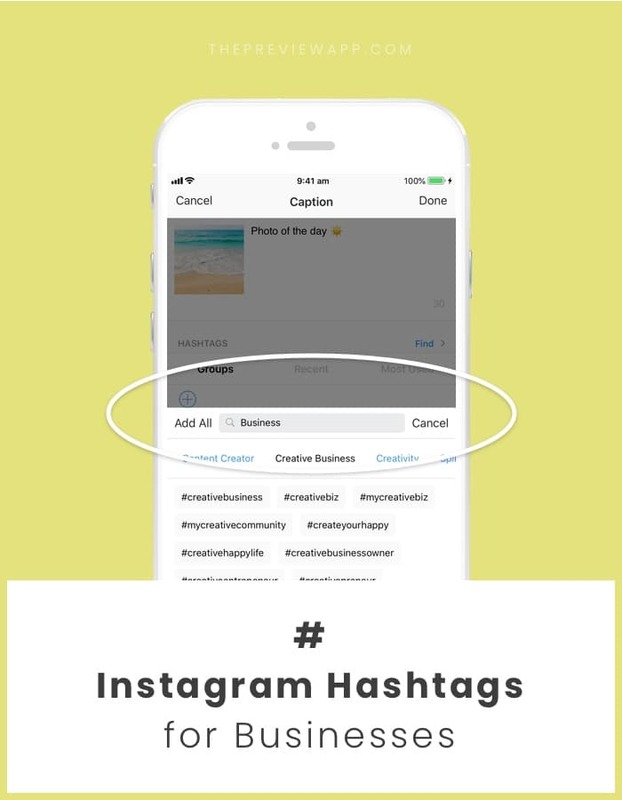 Search a category (like “business”) and the Hashtag Finder will give you lists of Instagram hashtags. Add any of the hashtags you want in your caption! Let’s talk about Instagram hashtags for business. There are so many different types of businesses out there. So I will let you explore the Hashtag Finder to find niche. This hashtag group is a general hashtag group. It will suit any business. It gathers trending Instagram hashtags for business and entrepreneurs. These hashtags are great to reach the general business community. 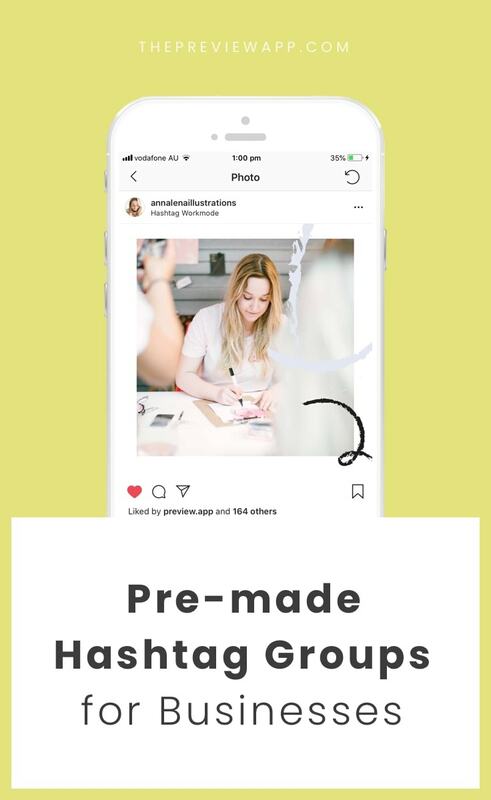 This hashtag group is great for designers, bloggers, solopreneurs, coaches, social media managers, marketing specialists, handmade business owners, and any other business that involves a creative design skill. Talking about creativity, this hashtag group is great if you want to use hashtags about creativity. There is a strong community of business women on Instagram. The app comes with a list of Instagram hashtags just for business women. This hashtag group has a mix of trending hashtags as well as smaller community hashtags. Another strong community on Instagram is the one of spiritual business women. If you promote manifestation, the power of the mind, and self-growth, this hashtag group is perfect for you. Quick note: Preview also has a bunch of hashtags for manifestation, wellness, meditation, spirituality, etc… Make sure to check these out. They will complement your business hashtags. If you are a coach, this small hashtag group gathers the most popular hashtags for you. And last (but not least) is a hashtag group for content creators. Get your work noticed. Use these hashtags to enter the community of content creators. Do you know other hashtags? Did you find an awesome hashtag community? If you want us to add any other hashtags in Preview, please leave a comment below. We’re always happy to add more hashtag groups and communities in the app.